Company branded video games have a bad history in the industry. There have been a few good ones here and there. Crayola Scoot has a lot going against it in those regards. This game can be found on the Nintendo Switch, PC, PS4, and Xbox One. We were given codes on the Xbox One and Switch. We only used the Xbox One code. I am very thankful we got it. Hopefully you are enjoying the video series. If not, please click here. This game is an interesting blend of styles. We have the Tony Hawk kind of tricks going on (with a scooter). We have painting the areas like Splatoon. There are different goals in the levels in Crayola Scoot. In some levels we must paint the most area our color. In others we do other things. These can range from getting the most crayons to tagging the other scooter characters. Every so often in Crayola Scoot we face other characters in a game of S.C.O.O.T. We must make the highest combo score to get the other character to get a letter. Once we beat them then we can purchase parts to their scooter. Crayola Scoot has a shop, arcade, and more. Up to four family members can enjoy Crayola Scoot at the same time in the local split screen mode. Crayola Scoot looks good graphically, and it has good sounds to it. 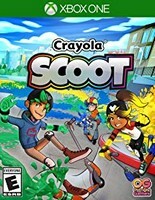 The only issue I can see families having with Crayola Scoot is certain characters. Crayola Scoot includes a witch and a zombie. I want you to know about it so you are not surprised. I got past them as quickly as I could and moved on to other levels. There are three difficulty settings on each of the levels in Crayola Scoot. There is plenty to do in Crayola Scoot. I love how we color the areas in Crayola Scoot. The areas are also much larger than I was expecting. The Crayola branding in Crayola Scoot is not intrusive in my opinion. I had a lot of fun playing Crayola Scoot. The best thing about Crayola Scoot is it introduces us to a new mixture of genres that makes both of them better.